-Specially designed for dressing your pet dogs or cats. -Artistically detailed in quality and fashion style to match your puppy hair. -With plastic buckle for easy wearing. -A perfect thing to make your pets different, to be cooler, more beautiful or gentler then others. 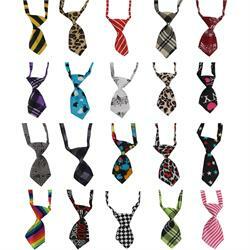 -Makes your pet looked smart and beautiful, Let your dog/cat puppy stand out with these adorable selected bow ties ! -With 40 different styles included, make your darling more attractive and energetic.